Are you adopted and searching for your ancestors? Are you are trying to find an adopted mother’s bio­logical family line? If you have one of these problems an mtDNA test may help. Although there are no guarantees of success, this is the most logical path to try. Finding an adopted female’s ancestors using mtDNA can be difficult given the problem with the mitochondria mutating so slowly. The first approach should be to get any birth records or adoption records if at all possible. 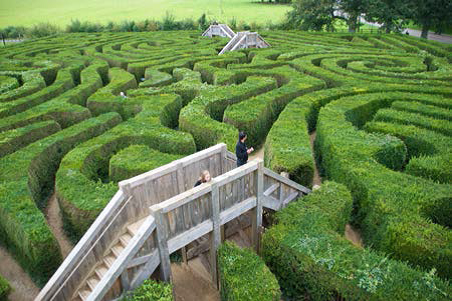 Admittedly, this is not easy, as the information each state obtains varies, as does the information they will share. There are a few websites that may be of help. Google the term “Adoption Search Angels.” You will find many sites including About.com which will guide you through some of the resources avail­able. Volunteer search angels can help you get started. Facebook has Adoption Free Search Angels at https://www.facebook.com/pages/Adoption-Free-Search-Angels/156749834387458 which may provide some additional information. Yahoo has the group, Adoption-Search- Angels, at https://groups.yahoo.com/neo/groups/Adoption-Search-Angels/info. 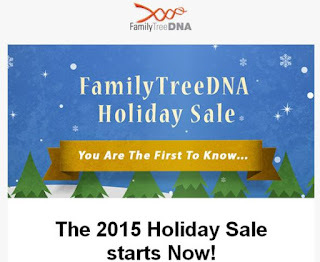 Also on Yahoo is DNA­Adoption at https://groups.yahoo.com/neo/groups/DNAAdoption/info. Consider joining one or both of these groups. Richard Hill’s site, dna Testing Adviser has a wonderful section on adoption. See: http://www. dna-testing-adviser.com/AdoptionSearch.html. Locating a female on your all-female line as a candidate to test is a challenge. First, determine in what area or county your last proven ancestor lived. You may need to check all the available records, not just the usual ones, to see if there are any clues that indicate possible parents. Sometimes there is oral history in the family which may lead you to a possible connection. If you can locate enough circumstantial evidence to suggest the parents, you then need to bring down an all-female line to present day and test that person. If the result matches you, your brother who shares your same mother, or some direct-line female you know is related to you on your all-female line, you have found your relatives! mtDNA testing works best in genealogy if you have a specific problem to solve and can find viable candidates to test. Following are some mtDNA success stories, originally posted on the International Society of Genetic Genealogy website, http://www.isogg.org/ reprinted with permission. “Emma’s mother was unwed and barely 18 years old. When Emma was born, an old preacher abducted her and raised her as his own. He probably thought he was doing the right thing, and later he claimed to have le­gally adopted her (e.g. 1930 census). Emma was raised with the preacher’s surname and she never knew her biological mother’s name. Emma’s daughter recently started to add some genealogical evidence to the family stories so she could present an iron-clad story of her ancestry to Emma before she died. Despite the daughter’s best efforts, there was always some doubt that she had the right family. Emma’s daughter did some research on the web and discovered that mtDNA might offer a tool to solve this puzzle once and for all. “I started to seriously research my heritage about 12 years ago. I purchased an early version of Family Tree Maker (FTM) and admittedly, the box sat on the shelf for a while as I gathered up what I knew personally about my ancestors. I made inquiries to my father who, though I hadn’t had much contact with him since I was quite young, was willing to send me reams of papers and copies of documents such as family bibles. On my mother’s side I was fortunate, as well. Apparently, an aunt, who had recently passed, had begun to document my maternal side. Her research went to another aunt with whom I was very close. As my mother was explaining what I was doing, over the phone and in French, my aunt told my mother that I could expect the papers soon. I knew my mother was French; it was “her first language,” she tells me. And just looking at my uncles, aunts, cousins, and pictures of my grandparents, well, you can tell. Along with the materials forwarded to me, and the information I gleaned from oral histories given by living relatives, I was able to document my direct maternal line back seven generations, though many other marital offshoots led even further back. According to what I had on hand, my furthest known direct maternal-line ancestor was Clothilde Quinter and the spelling was questionable. For many years, and through several software updates, I continued to explore the various branches. A couple of years ago I came across an article in Time, I believe, relating DNA research conducted on a fossil found on a mountaintop in the Alps. After researching online, I signed up to have my own DNA tested, and my step-father, and his mother, to see if there would be anything productive to aid in my research. I had, by this time, become the so-called family genealogy “expert” and had worked on my wife’s family and that of several friends. Of the three of us who submitted to testing, only my step-father benefited—until last week. I received an email from Lucie LeBlanc Consentino which began in a familiar way as I had received other inquiries that led, effectively, nowhere. 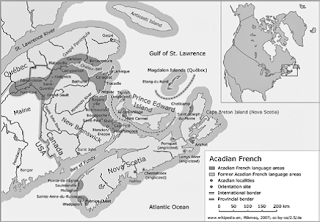 Lucie inquired as to whether I was of Acadian descent, and whether I would be interested in participating in a project. I quickly replied, and we ex­changed several emails the very first day. 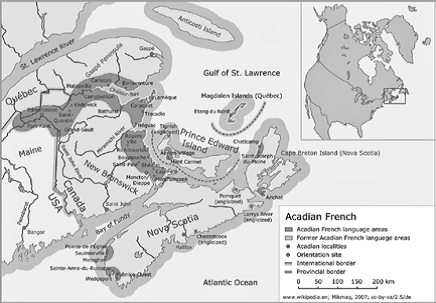 In one of these I provided her with information about my maternal line, and she introduced me to the project; further offering to forward my information to noted [Acadian French heritage] researcher Stephen A. White. How very pleased I was to relate to my mother, only two days following, that Mr. White had not only corrected a couple of errors in my information, but was able to provide detailed information about my direct maternal line which he had extended to twice its length. One of these “errors” might have been the stumbling block for my own research, yet by combining his knowledge of my mtDNA and his extensive research on Acadian heritages, he was able to double my maternal line to fourteen generations. “I have been doing some form of family his­tory research for over 30 years. During that time I traced my mother’s family on the male lineage back to France and was delighted with the results. In the meantime, a cousin on my father’s side took up that research, and I started on my husband’s European lines from Germany, Belgium, Luxembourg, and France. I have been a subscriber to Richard Eastman’s Genealogy Newsletter for a long time, and about two years ago I read an article he wrote about dna testing. I thought it sounded interesting, so I ordered the basic test, and then decided to go to the second level of testing. Because it is mtDNA and traces the direct maternal line, I went back and started researching that line, promptly running into a brick wall. Even though I had two major source books I could not find any information before the mid-1700s. I started a broader search and discovered that my mater­nal line may have immigrated to Acadia (Nova Scotia) in the mid-1600s. I was doing online research and thought that I had figured out my maternal lineage, but because I had no access to primary sources I could not be sure. I joined the French Heritage DNA Project during this time. Very recently I received an invitation to join an mtDNA project and I accepted. I sent the information on my maternal lineage to Lucie LeBlanc Consentino who sent it to Stephen White for verification. After fewer corrections than I expected, I can now lay claim to being a sixteenth generation descendant from a daughter of Acadia, Jeanne Motin de Reux. I am fortunate to descend from such a distinguished line, because at sixteen generations it gives me the longest female-line lineage to date. On my paternal line, my cousin had done all the research and we thought we knew which English Car­ter line we could claim as our ancestors, but one link was weak on documentation. We convinced our Carter male first cousin to have his DNA tested and submitted our lineage to the Carter Society. Through the DNA test comparisons we were able to determine which Carter settler of the New World we descended from. Appeared in the GFO Bulletin, Volume 64, No. 1, September 2014. For more information about DNA, read Emily’s book, Genetic Genealogy: The Basics and Beyond which can be purchased online at AuthorHouse.com, Amazon.com, and Barnes and Noble in paperback or as an e-book. The book can be ordered at any bookstore.